Richard Bedford Bennett was a remarkable man. Born to a poor New Brunswick family, he was a high school principal at age 19 and a multi-millionaire corporate lawyer who was the president of several companies and on the boards of more by age 30. He gave nearly all of his money away to charities, individuals and schools. He was an engaged citizen. Bennett served on municipal council in New Brunswick, as a territorial representative then Calgary Member of Provincial Parliament, first leader of Alberta Conservative Party then federal cabinet minister and finally, in 1930, the prime minister of Canada. But there was even more. Bennett was a transformational leader. His government created the Bank of Canada, the CBC, the Canada Wheat Board and helped the millions suffering from the depression with minimum wage laws, unemployment insurance and infrastructure projects. He also negotiated deals that after his tenure would create the St. Lawrence Seaway, increased trade with the United States and constitutional changes that would allow the establishment of social programs Canadians now see as their birthright. The book was released to critical acclaim and appeared on the Globe and Mail’s bestseller list in 2010. It was released in paperback by Fredericton’s Gooselane Editions in 2012. “Not much has been known about R. B. Bennett. Amazingly, no full scale biography was written about him until now, 75 years on. John Boyko has finally done the dead and indeed has done it well.” – Lawrence Martin, author of Harperland. “Although he has gone down in history as a prig, the portrait that emerges from the rich and abundantly researched Boyko account is a largely favourable one. It is good to see that this much-degraded figure finally gets some credit.” – Globe and Mail. “With this book, Boyko has not only shown so many parallels between yesteryear and today, but that R. B. Bennett still has much to teach us – and the man holding the current reins of power – about governing during troubled times.” – Ottawa Citizen. “Franklin Roosevelt was America’s R. B. Bennett…they were alike in the radicalism of their responses to the Great Depression and in their concern for the fate of ordinary people – and in this biography, the first serious study of Bennett in half a century, Boyko gives us back an extraordinary Canadian.” – Gwynne Dyer, author of Climate Wars. “Required reading for any Canadian… Wherever one is on the right-left political spectrum, this masterful work connects the dots between the forces that opened the door to social innovation – forces unleased and turbo-charged by the decency and will of R. B. Bennett himself.” – Senator Hugh Segal, author of The Right Balance. “A brilliant and unprecedented portrait of one of Canada’s most important, and least understood political leaders. 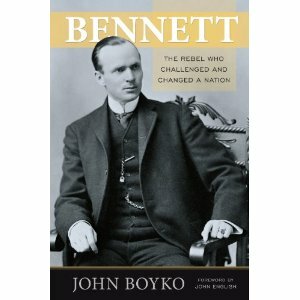 Superbly researched and wonderfully written, John Boyko has produced the definitive biography of R. B. Bennett, a transformational prime minister who established important national intuitions that remain the cornerstone of Canadian life today.” – Bob Plamondon, author of Blue Thunder and Full Circle.